!!! SUBSCRIBE TO OUR NEWSLETTER – FREE GIFT !!! 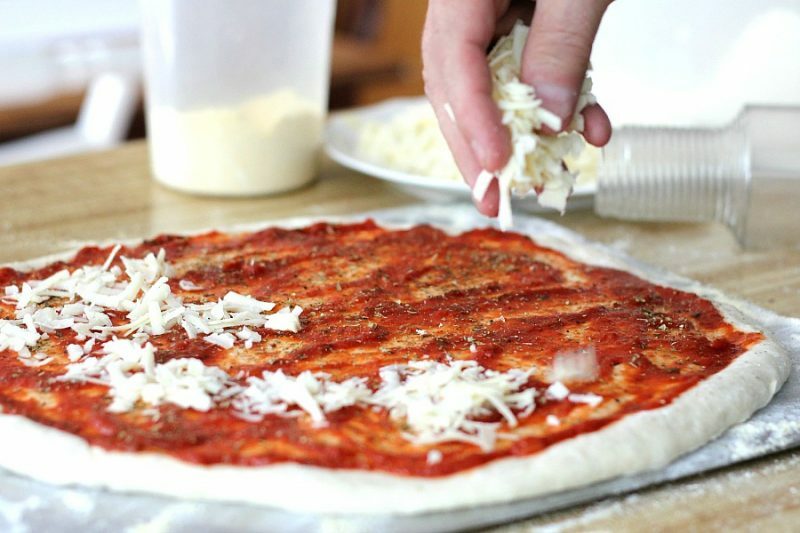 Making homemade Pizza dough is easy, delicious and so economical. 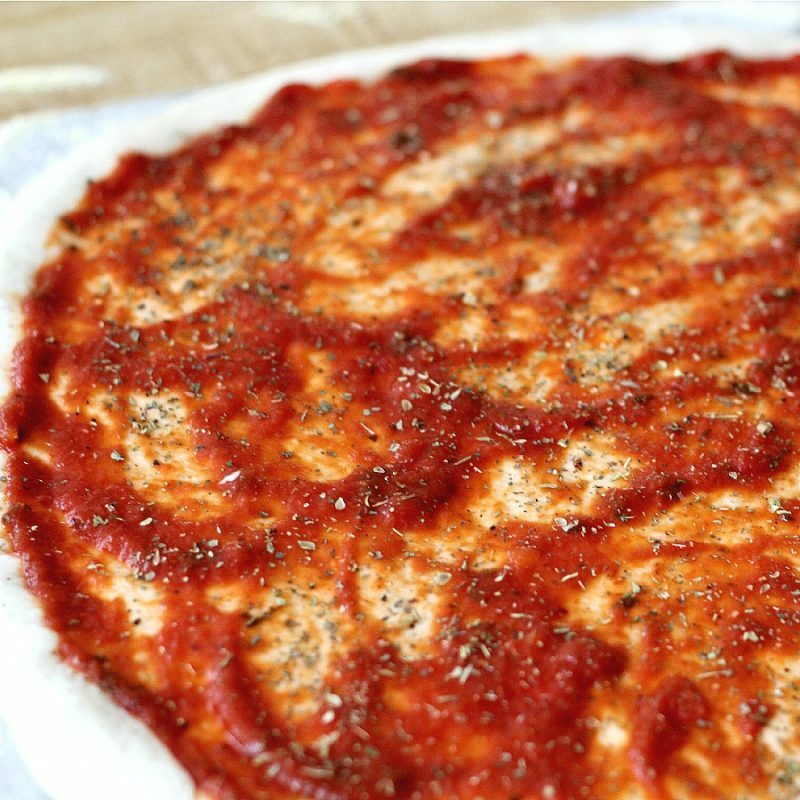 Just a few ingredients, a little time and you are ready to add your favorite pizza sauce and toppings. Bake in a hot oven until cheese is melted and crust is perfect. I provide childcare for precious little Ella. She is bit finicky about food but would absolutely eat pizza every single day for her lunch. She loves frozen pizza that I just warm in the oven but some days we make homemade pizza together. Making the pizza dough in the bread machine is the easiest part. After the dough is made, we roll and pat it into a circle on a cookie sheet that we sprinkled with cornmeal and a little flour. Spread on the pizza sauce. And top with Mozzarella Cheese. For a nice crispy crust, I heat a pizza stone in the over to 420 degrees. The trickiest part (for me) of making the pizza is transferring it from the cookie sheet onto the hot pizza stone. Plenty of cornmeal on the bottom and a few hard shakes helps the dough slip off easily. Be CAREFUL ~ the oven and stone are very HOT! I recently tried substituting all-purpose flour for the bread flour. I found no difference in texture, rising or taste. I have also made the dough using my KitchenAid mixer and it bakes up just the same. Personalize your pizza but adding different cheeses. Here is a pizza with both mozzarella and cheddar. Here is my dough recipe that came with my first bread maker. We like it because it rises really nice and tastes great. Place dough ingredients in bread pan in order listed. Set on basic dough and press start button. 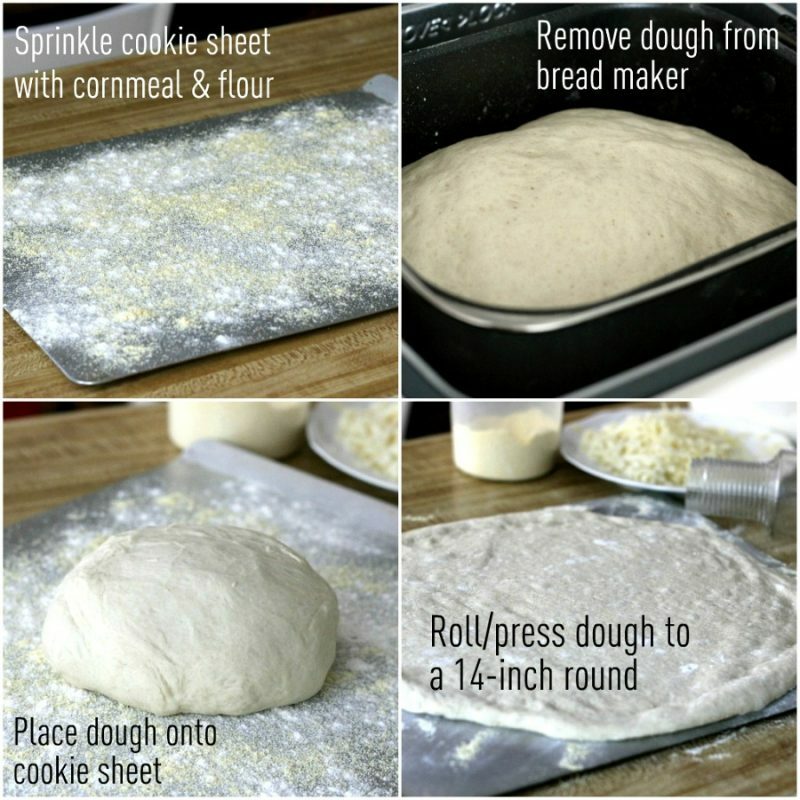 When cycle is completed, remove dough from bread pan. Preheat oven and pizza stone to 420 degrees. Punch dough down. Pat/roll dough on a cookie sheet (one with no sides) that has been sprinkled with cornmeal and a little flour, shaping edges to form a crust. 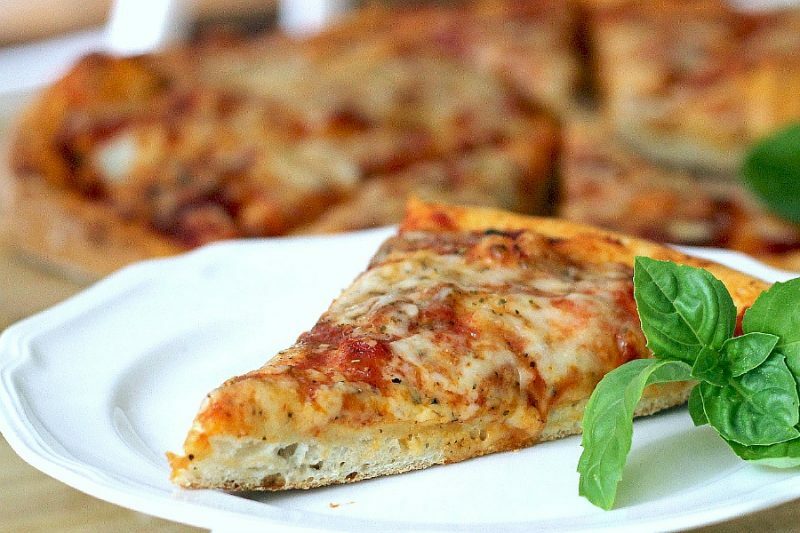 Spread on your favorite pizza sauce, herbs and toppings of choice. 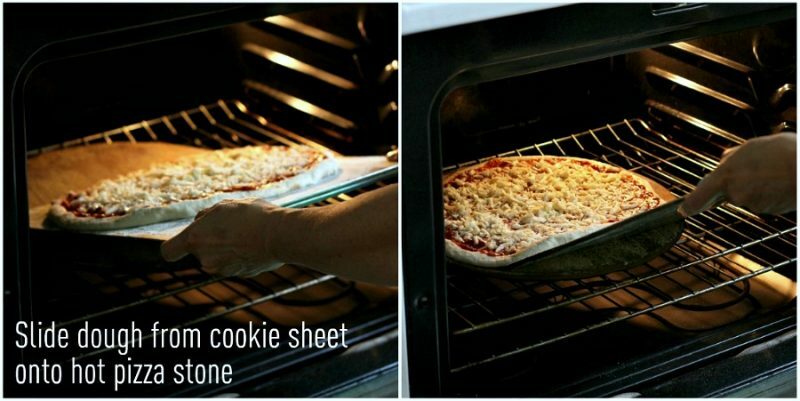 CAREFULLY slide the pizza from the cookie sheet onto the stone (that is in the oven). Bake for 15 minutes until done. 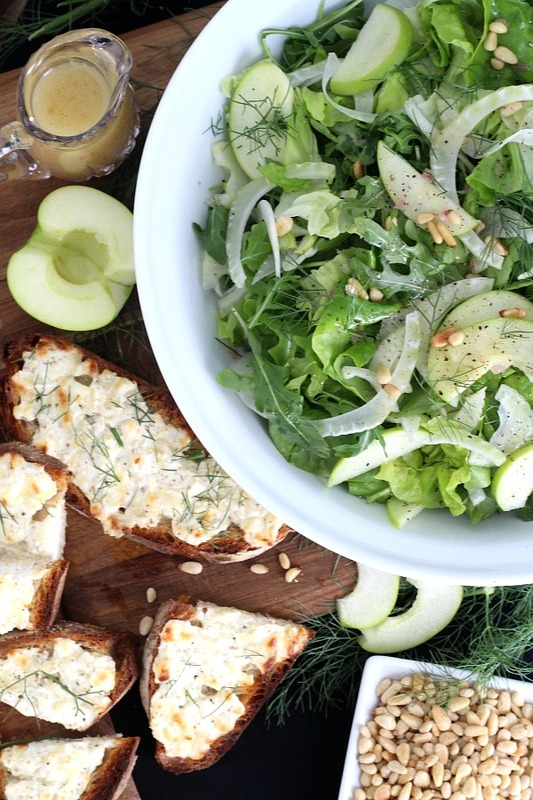 mm mm… your house will smell wonderful and your tummy will be happy! If you enjoyed this post, you’ll love my weekly email. Subscribe to have updates delivered to your inbox and receive FREE gifts available exclusively for subscribers. 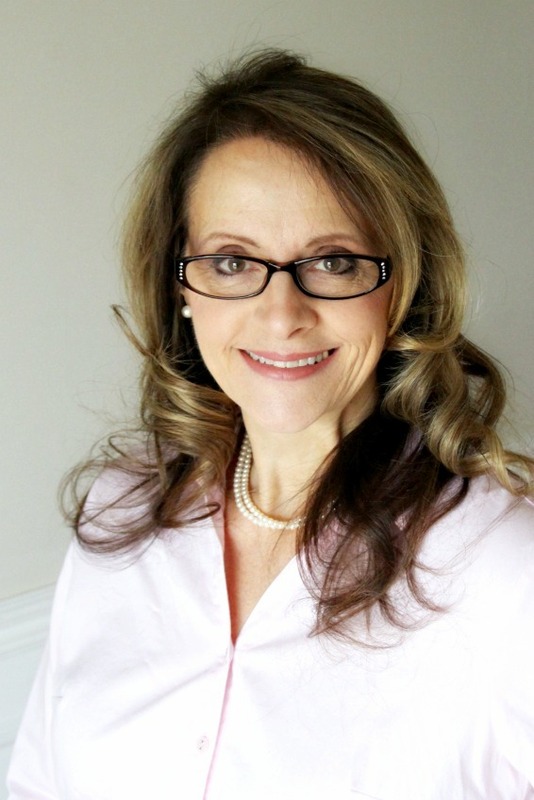 Don’t miss new content with recipes, crafts and ideas to inspire & encourage you. We would love for you to join our community. Just click the subscribe button below. Looks delish! I tried to make homemade pizza once…..once. Leave it to you Lorraine to have a wonderful pizza recipe. I love the idea of adding your own toppings. And it will definitely be hot instead of getting cold after delivery. I am pinning this one. Beautiful photos and explained so well!! You share the best recipes, with us, and they always turn out perfect. 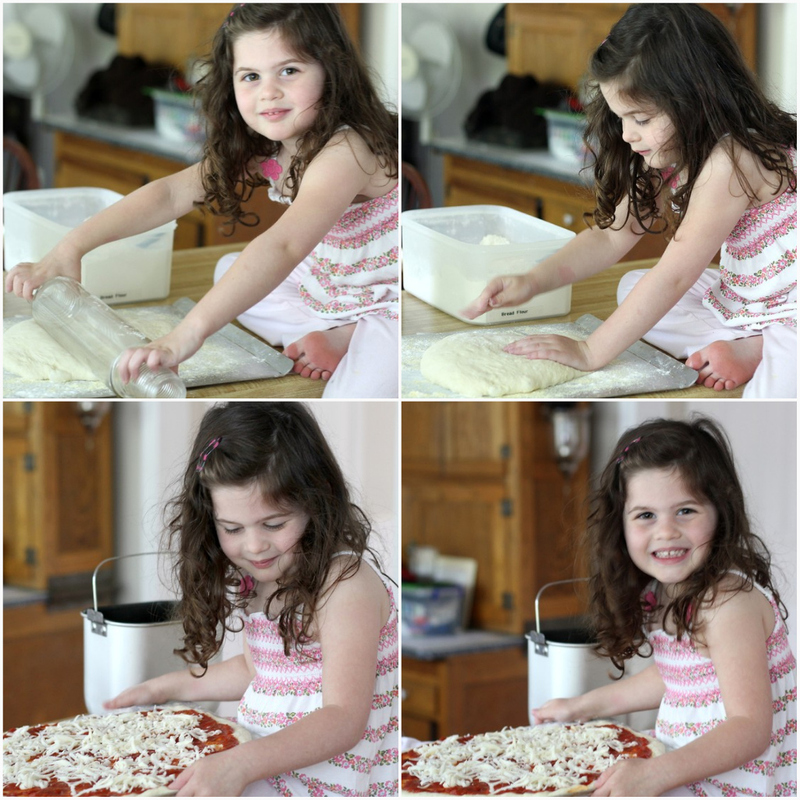 I will come back and copy this pizza dough recipe for my keeping. The best thing about this post is seeing your granddaughter Ella, making and enjoying these memories with you, what a treasure. Looks fantastic! And what an adorable little helper! Now I know what I'm going to make for dinner this week. Pizza! 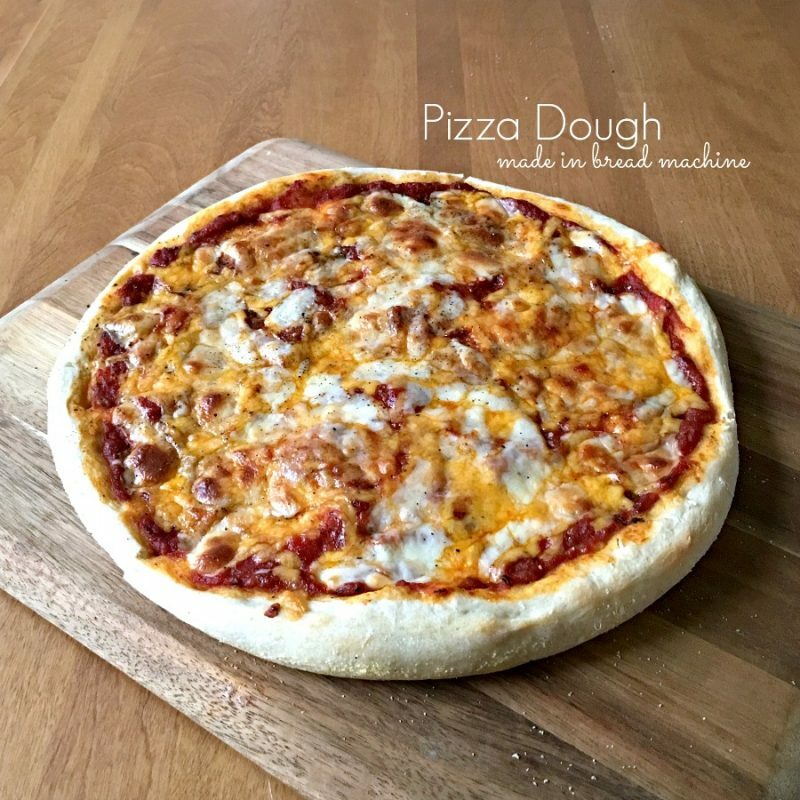 Hi, The pizza looks wonderful and I am going to try your recipe with my bread machine. You site is very charming. I have enjoyed the reading. 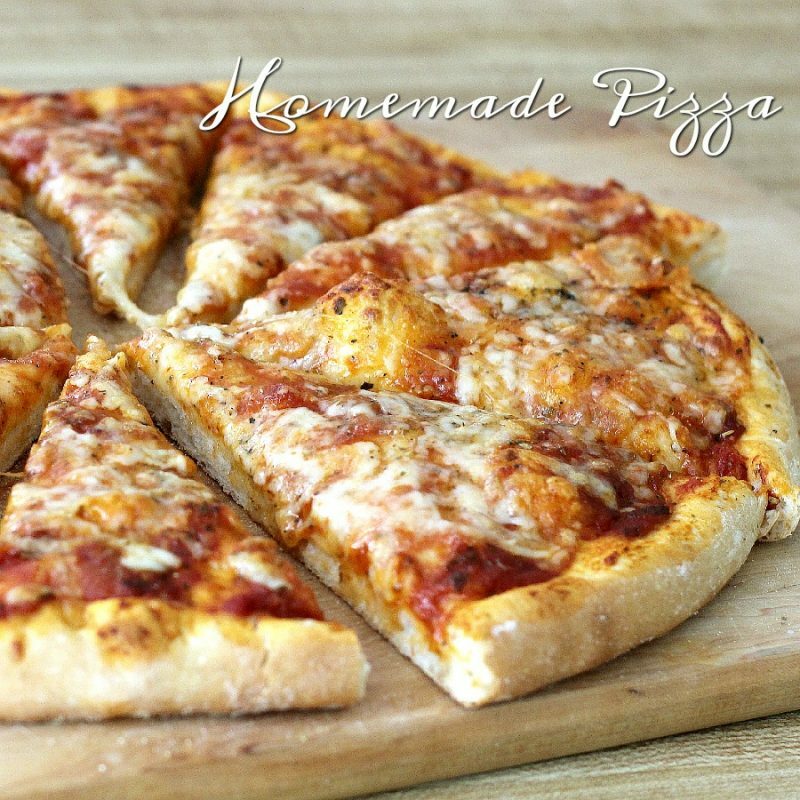 I still have never tried making homemade pizza, and I'm so ashamed! I'm just like Ella, though- I would eat pizza for every meal if I could. Your looks extra delicious! What an adorable kitchen helper! I could eat pizza every day, too! Thanks for sharing your recipe and your photos! That looks fabulous, I love pizza. A wood peel makes getting the dough onto the stone easier. Keep your eyes open for one. I don't have a bread maker. What recipe do you use for your KA? What a sweet helper you have. Thanks for the receipes. I'm with Ella, I'll have pizza any time, day or night 🙂 I think I would prefer some of your home made over the frozen ones though. That looks totally delicious. Ella is a very pretty assistant and the pizza makes me so hungry! Wishing you a great week Lorraine. Hi! I'm Lorraine. Welcome to Grateful Prayer Thankful Heart. A place to find food for your tummy, projects for your hands, and encouragement for your heart.